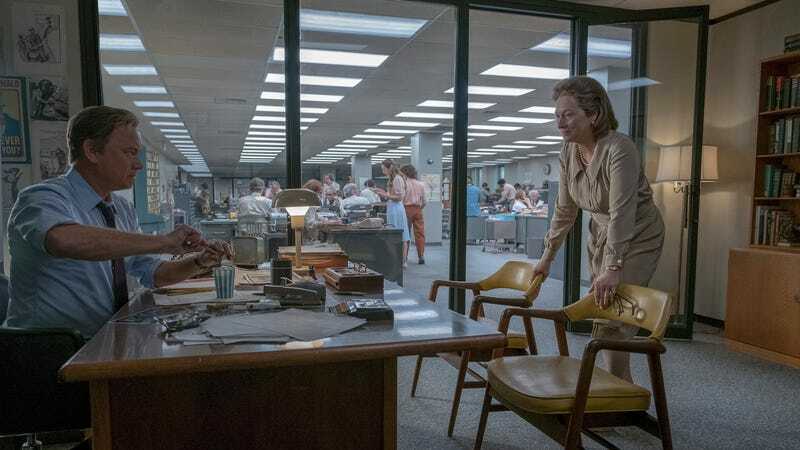 As reported by Variety, the National Board Of Review has named Steven Spielberg’s The Post as its Movie Of The Year, with stars Tom Hanks and Meryl Streep also landing the top acting honors. Spielberg himself got shut out, though, with Lady Bird’s Greta Gerwig taking the directing award. Speaking of Lady Bird, Laurie Metcalf won the National Board Of Review’s Best Supporting Actress award, with The Florida Project’s Willem Dafoe getting the actor equivalent. Other winners include The Disaster Artist and Phantom Thread, which won the screenplay awards, Coco winning the animated feature award, and Get Out winning for directorial debut and ensemble performance. Back in March, we joked that The Post was an attempt by Spielberg, Hanks, and Streep to “win all the Oscars,” and while The Post’s good showing here does seem like a good sign for that, it’s worth noting that the National Board Of Review’s top film last year was Manchester By The Sea, which didn’t win Best Picture at the Academy Awards. The year before that was Mad Max: Fury Road, which probably deserved Best Picture but also didn’t win.